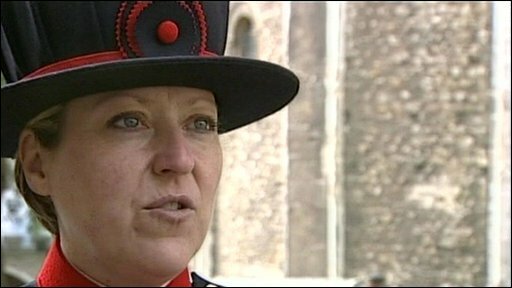 Two Beefeaters at the Tower of London have been dismissed for harassing Moira Cameron, the first female Beefeater. Earlier this month Miss Cameron, from Argyll, complained that she had been subjected to a bullying campaign by some male colleagues. The case against a third Yeoman Warder was not proven. Miss Cameron became a Beefeater in 2007. Officially known as yeoman warders, Beefeaters have guarded the Tower in central London since 1485. A Tower of London spokesman said: "When the allegations arose, the Tower of London immediately initiated a thorough investigation, in line with harassment policy procedures. "In light of the evidence that emerged, the investigation concluded that the allegations had foundation and that disciplinary action was appropriate." Earlier this month a 56-year-old man received a police caution for defacing Miss Cameron's entry on online encyclopaedia Wikipedia. The two sacked Beefeaters have the right to lodge an appeal within a week, and the third will return to work shortly. The Tower of London spokesman added: "We believe everyone is entitled to work in an environment free from any form of harassment. "This has been a difficult time for the community at the Tower of London, and the Yeoman Body especially." 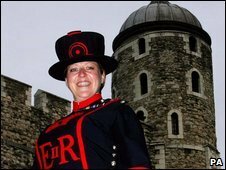 Miss Cameron is the only woman among the 35 yeoman warders at the Tower of London. The 44-year-old became the first female yeoman warder in the institution's history after completing the required 22 years of service in the Army. The yeoman warders were appointed by Henry VII to guard the prisoners and attend the gates of the Tower. Although their role is now mostly ceremonial, their duties include guarding the Tower and the Crown Jewels. All the Beefeaters, who got their name because of their meat rations, live in flats in the Tower. When Miss Cameron was made a Beefeater in July 2007, she admitted that her appointment was not welcomed by everyone. She said at the time: "I've had some comments. I had one chap at the gate one day who said he was completely and utterly against me doing the job. "I said to him: 'I would like to thank you for dismissing my 22 years' service in Her Majesty's Armed Forces'." She did not comment about Wednesday's decision.